Stolen Time was one of those books where everything I expected was surpassed. I hadn’t heard much about this book, but I requested it because time travel will always get me. But what I ended up reading was a story about hope, friendship, and the long con. Stolen Time is one of those books that will continue to surprise you from the beginning to the end. It is a book about our race against time, our ability to find hope, and to find friends in the most unlikely places. Both Ash and Dorothy have this cunning and sharp edged part of their personality. Whether it be Dorothy’s lock picking skills or her inability to believe people could be friends with her, I adored Dorothy’s character and her steadfast determination. And Ash’s commitment to undoing the mysteries of the book, along with his terrifying visions made him such an empathetic character. But what really sets Stolen Time apart is Rollins’ ability to weave a clever and inventive plot. Even days after finishing it, I still can’t believe all the different ways Rollins wove in and out of the story. And the ending has this jaw dropping moment where all the pieces fit in and you are just stunned at the fantastic time traveling writing. Time travel is one of those difficult subjects. You can get stuck in paradoxes, and science, but Rollins makes time travel approachable for all of us. And while doing so, places our feet on a journey we will not regret. Not to mention that Dorothy’s relationship with her mother was incredibly complex. Dorothy’s mother teaches her to rely only on herself in a very much tough love approach. But it leaves her feeling guarded, unable to truly trust the person who should love her. Stealing is second nature for her, first nature even and she quickly learns you can always take from others. But another element of the story that Rollins executes perfectly are alternating chapters of a diary. Dorothy learns that time is a circle. That while we think of the past, present and future existing for us in a line, it really lives in a circle, happening at simultaneous points. And what better example of this is a diary which answers our questions about Ash and the larger story at work. While we see snippets of the past, juxtaposed with moments in the present and memories of the future, we become fully immersed in their more circular thinking. Suffice it to say, having finished Stolen Time I immediately need the second book. And once you finish, you’ll feel the exact same way. Yes Stolen Time ends with questions unanswered, but it’s not one of those cliffhangers where you feel betrayed, this is more satisfying and leaves you with excitement. I need to find out more about Dorothy because her journey to figure out how to trust and become friends, was so empathetic to me. While she has this mentality that no one does anything for free, Dorothy has to figure out that she doesn’t always have to be on her own. She could have a team, she could have friends, if she can let them in. 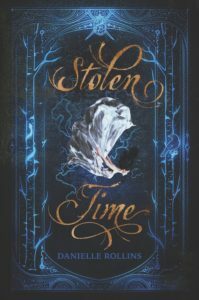 If you like books with fearless heroines, time travel, and clever writing, make sure to pick up Stolen Time. Find Stolen Time on Goodreads, Amazon, Indiebound & The Book Depository. Who is your favorite time traveler?